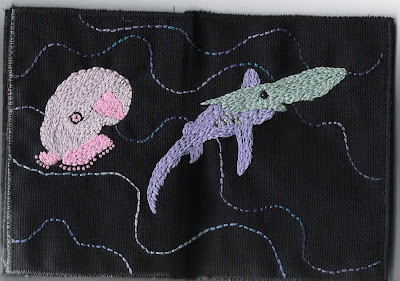 I finally finished my embroidered book! It seems like embroidery is all I've been doing this long weekend. 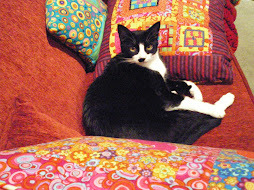 I took photos, but they didn't come out that well. Here are some scans, which still look a bit different from the real thing. This is the cover, opened out. I used metallic thread (couched), which is really sparkly in real life, for the front and plain perle cotton for the list on the back page (again more shiny in real life). 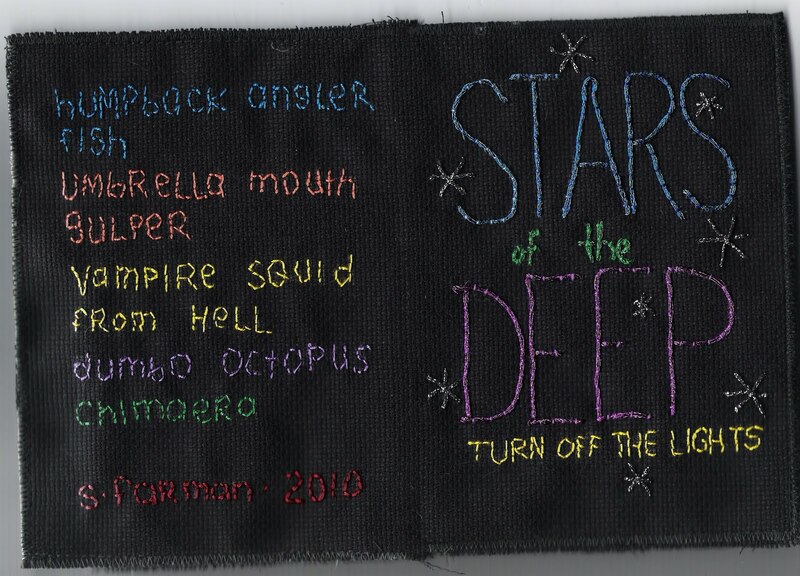 I was going to embroider another fish on the back but then I thought it would be fun to make the list, since all the creatures I did include have such cool names. 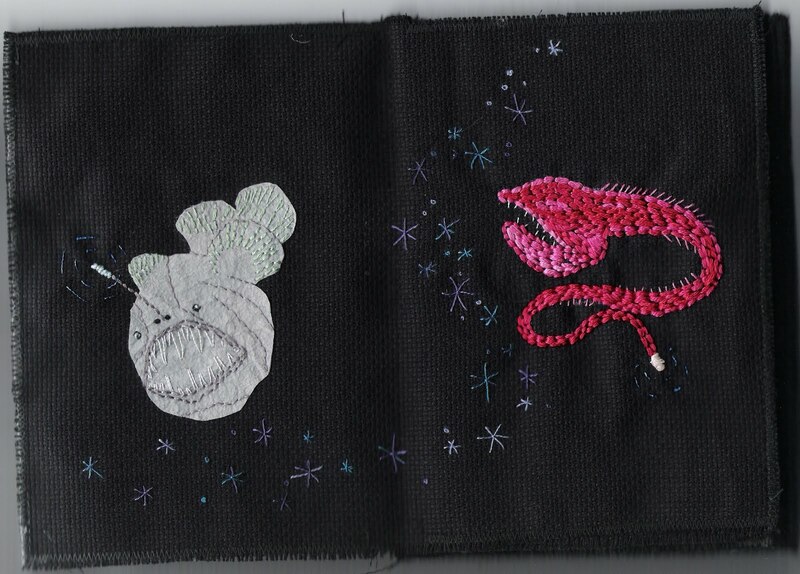 The second and third pages are the humpback angler fish and the umbrella mouth gulper, which both have bioluminescent extremities (done in glow in the dark thread, which unfortunately looks quite unspectacular in daylight). 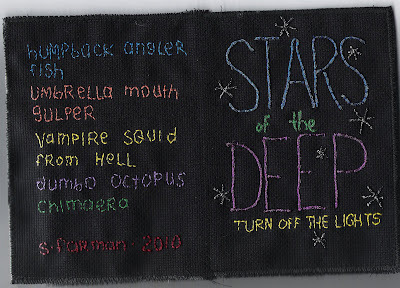 The middle page is the vampire squid from hell, which again is done with the bioluminescent spots in white DMC glow in the dark floss (much nicer to work with than the other GITD thread). 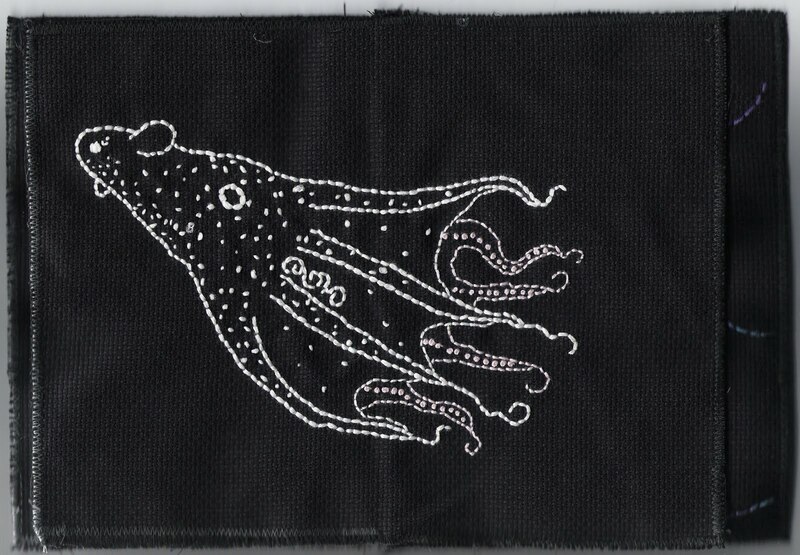 Also, the back tentacles are done in pale pink backstitch and french knots, which you can't quite tell in the scan. Pages 6 and 7 are the dumbo octopus and chimaera. This is the first time I've used split stitch as a filling stitch and it was surprisingly quick and easy. I felt like they needed something to unify them on the page, so I did some waves in blue variegeted floss. 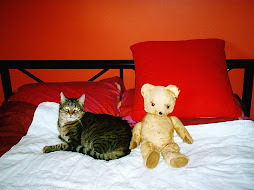 The colours look slightly washed out in the scan. I put the book together, mini-zine style, after first completing the embroidery on the sheet of linen. I had to trim the edges of the middle pages a bit to get the page widths even. Then I went along each edge with a small machine zig zag stitch. The finished book is about the size of a postcard. WOW, this is absolutely amazing!! Sam! It's fantastic!!! It really turned out awesome... I continue to be in love with that angler and gulper :) Sooo good! Sam, you did a freaking fabulous job...your partner is a lucky duck indeed. This is really special! Amazing! 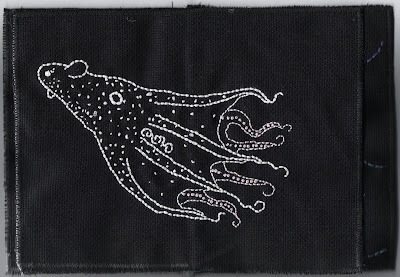 I just love the idea of an embroidered book, and such fascinating creatures you chose! Lovely work, have fun creating your next project! Wow! Amazing. Very inspiring. I want to try doing my own book now--never thought of doing that. Really fantastic and inspirational work. I have a buddy who is really interested in parasitology. Makes me want to create a book for him. :) Great job. Thanks, Ryan! Love your website btw, thanks for linking. No prob, Sam. Thanks for visiting, and for your comments as well. P.S. Hope your headache is getting better. <:( Sorry to read about that.